At the Scotland’s Towns Partnership Conference in Inverness last November, I extracted a pledge/promise (but most definitely not a vow) from the Towns Minister Derek Mackay to, one year on, reflect on progress against his Town Centre Action Plan (TCAP). To be fair, I suspect he’d have done it anyhow, but however we got there, the day has arrived. Yesterday, the Scottish Government published its review of progress on the TCAP. The review is available here and the associated press release here. Eagle eyed readers will spot that I am quoted in the press release (as is Malcolm Fraser, the leader of the National Review of Town Centres which led to TCAP). I do genuinely believe that much has been achieved in the year so far. But, there is also so much more that can be done and needs to be done, as all also recognise. There has been long time neglect of our town centres, which won’t be fixed in a year or two. 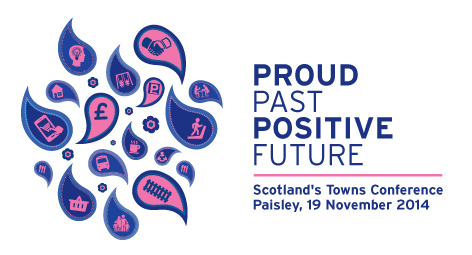 The role of Scotland’s Towns Partnership as the “go to” organisation for Scotland;s Towns. Discussion focused on the progress to date – recognized as good – and on the areas that needed more attention. Chief amongst these were digital, rates burden and housing/living in town centres. Lots of good (and bad) practice emerged showing just what can (and still needs to) be done. Gavin Brown and Sarah Boyack responded for their parties, both agreeing with TCAP and the progress that had been made, but pressing the Minister to do even more (Gavin Brown pointing to Nicola Sturgeon’s words in setting up Fraser – “every measure possible”). Issues raised included the capacity of planning and local authorities to provide civic leadership and the lack of progress on the Business Rates Incentive Scheme (and on the enhanced measure wanted by Fraser/EAG). A variety of MSPs then spoke on a variety of topics. Most could not resist the temptation to talk mainly about their own constituency towns, but in a few cases the discussion was lifted to general points about levers and opportunities more widely. It was a far better debate in this respect than those I have witnessed in Westminster. All supported the TCAP and especially the Town Centre First principle but were concerned to see that it is implemented and used. Cara Hilton, MSP for Dunfermline produced a really positive list of things being done in Dunfermline which also reflected a common theme of the many good things being done across Scotland. She mentioned the Carnegie Test Town project, the local BID, council investment and the Cycle Network development. It was perhaps a shame that Margaret McCulloch, the Chair of the All-Party Group on Town and Town Centres was unable to be at the debate due to illness and loss of voice (which must be a politician’s not so secret dread) as she would have brought a valuable over-arching view of towns and the Action Plan. But I suspect many of her issues were picked up by colleagues. In the closing statements the issues of business rates and local incentivisation were raised, but so too were the level of rents and the perhaps unrealistic demands of landlords, seen as stifling opportunity. Derek Mackay in closing paid tribute to a positive, constructive and useful debate, which he saw as focusing on town centre accessibility, rates and rents. He stressed the role of BIDS and repopulating the high street and looked forward to a forthcoming announcement on Business Rates Incentive Scheme. He emphasized the need to learn from issues around rates and to make sure the scheme incentivised real improvement and not serendipitous development or even development with an adverse effect on town centers. I do think that in contrast to what I observe in England, the action and momentum in Scotland is positive and certainly the government and opposition are engaged in a supportive debate and dialogue (not least via the Cross Party Group) about town centers. Yes, there are differences, but there is also a lot of common ground. We will reflect on this more perhaps in an upcoming Trading Places column. One of the perhaps forgotten issues in the debate was the opportunity that the forthcoming rates revaluation will allow, for perhaps a fundamental rethink of what rates are for and what effects they have on our places. Possibly such silence is inevitable at this point given the various timescales being operated and the difficulties of re-engineering such a money spinning system (even if it is broken for business and towns). And if all of this town centre action is not enough, then in Paisley on the 19th November, Derek Mackay will open the next Scotland Towns Conference by reflecting further on TCAP and looking forward to the necessary actions in the coming year. This entry was posted in BIDS, Government, High Streets, Local Data Company, Planning, Public Realm, Rates, Regeneration, Rents, Retail Planning, Scotland's Town and High Streets, Scotland's Towns Partnership, Town Centre Action Plan, Town Centre Review, Town Centres, Towns and tagged BIDs, Debate, Digital, Fraser review, Government, Scotland's Towns, Scotland's Towns Conference, Scotland's Towns Partnership, Town Centre Action plan. Bookmark the permalink.